Del City ships directly to over 80 countries worldwide. 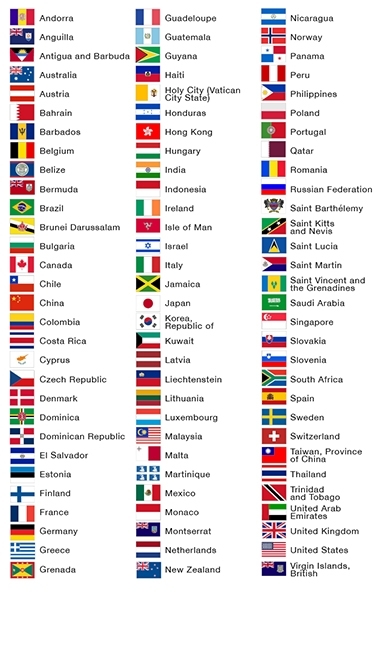 We strive to offer the best service to all of our customers so if you do not see your country on this list, please contact us and we can look into different accommodating ship methods. Shipping to Canada is easy with Del City. By utilizing our UPS Canada Standard shipping option all charges for your order will be itemized on the payment page during checkout. This includes all freight costs, border crossing fees, duties, and taxes. UPS will not collect any additional fees at time of delivery. By selecting UPS Canada Standard you will also receive a flat rate fee of $14.99 on all order up to $300. Any order exceeding $300 will be charged a flat 5% fee on your order total. Any UPS Expedited, UPS Express, and FedEx shipments will be charged freight costs after order placement at time of shipment. FedEx/UPS will also collect all taxes, duty, and carrier specific fees at time of delivery. Use these ship methods with caution as charges and fees can be excessive. Del City has partnered with i-Parcel to provide our customers with an efficient global fulfillment solution that is fast, affordable, and easy to use. Rates are determined by the ship to country and the weight of the items purchased. To receive an estimate you can either start a new cart with your international ship to address and see all charges on the checkout page or contact us directly for a quote. If you are shipping to one of our 80+ locations you will receive a fully landed cost at time of checkout. That means all charges applied to your order will be completely transparent at time of checkout. These charges include: freight costs, border crossing fees, duties, and taxes. You will not have to pay any additional fees upon delivery. If you are located outside of the United States, Canada, and Puerto Rico you may have been prompted with a pop-up when you first visited our site. This pop-up allows you select your country so you may see all of our prices in your localized currency. If you did not receive this pop-up but would like to shop in your local currency, click on the button below to select your country. Any UPS Express and FedEx shipments will be charged freight costs after order placement at time of shipment. FedEx/UPS will also collect all taxes, duty, and carrier specific fees at time of delivery. Use these ship methods with caution as charges and fees can be excessive.